Nothing beats an American made pair of work boots that can protect your feet and keep you comfortable for hours. Support your local economy and browse through our selection of the best American made work boots you can find online. We’ve closely reviewed a handful of men’s and women’s boots, all made in the USA and designed to last for years. Below, you can see how they ranked in terms of dependability, quality materials, comfort, strength, and affordability. To begin with, you’ll see Thorogood boots more than once on our list, and for a very good reason. 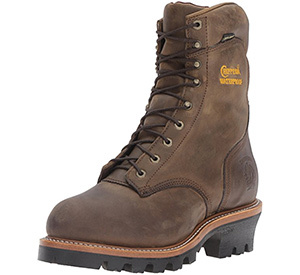 The company’s high-quality and durable models are some of the best American made work boots out there. For instance, the Thorogood MAXWear boots are designed with comfort in mind, boasting features like a dual-density footbed. Stylish: The MAXWear boots are great for getting the job done and looking nice at the same time. They are ideal for quick transitions from the office to the job-site. Soft: As opposed to competitors, Thorogood has designed the MAXWear boots to feature soft, malleable leather. Not for heavy-duty: The 6″ plain toe boots are not waterproof or insulated, nor do they provide any safety for your toes. Danner’s Mountain Light Cascade may not be what you think of when you envision work boots, especially since they fall under the hiking category. 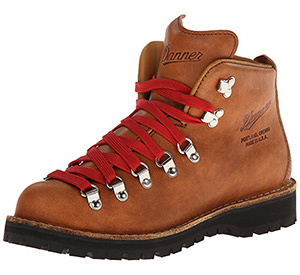 However, Danner manufactures some of the best American made boots in the country. Therefore, their boots have special features to offer your feet support, comfort, and stability over all types of terrain. Alternatively, you can check out our list of the best work boots for women of the year. Dependable investment: Customers claim that Danner boots can last up to a decade with the proper care. Purposely wide: The design of the boot is wider than expected, to maximize underfoot-stability. Expensive: You’ll pay a hefty price for the Mountain Light Cascade boots, as they’re the most expensive on our list. Nevertheless, if you’re shopping for American made leather boots on a budget, Wood n’ Stream is the brand to go for. 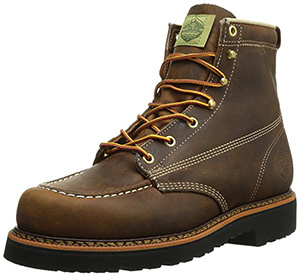 The company’s 7011 boots are crafted with high-quality leather, Scotch-guarded and triple-stitched for durability. Additionally, they’re lightweight and loaded with traction-lugs for the job ahead. 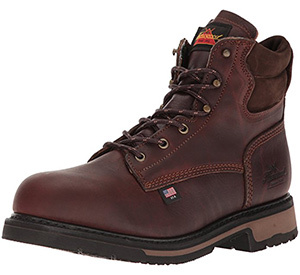 If you’re all about getting a good fit, we recommend our full list of comfortable work boots. Lightweight and comfortable: The 7011 boots do not have a safety-toe, but they are designed to be walked in and worked on all day. 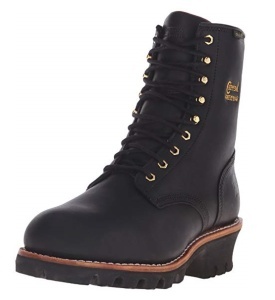 Affordable: You can purchase them even if you’re shopping for work boots on a tight budget. No insulation: The Wood n’ Stream boots may not be best for cold weather, as they are not completely waterproof and contain no extra insulation. Chippewa is an American company that specializes in hiking, work, and logger boots for men and women. The brand’s 73050 boots offer superior traction-control and comfort for your feet during any work, in any conditions. From winter construction jobs to yard work and climbing, Chippewa boots do it all. Dry, warm, and comfortable: The 73050 boots are ideal for harsh conditions since they have exceptional insulation and waterproofing. Long product life: Users are thrilled that Chippewa boots withstand more than five years of excessive use. Expensive: You may have to increase your budget to get the 73050 boots, but you are certainly paying for quality. 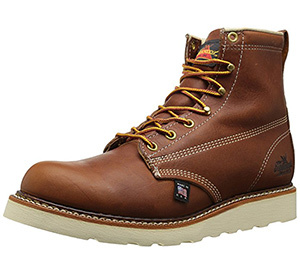 No surprise here that Chippewa is back on our list, now with their 9-inch logger boots. In terms of stability, their extra-thick traction soles make them some of the best American made work boots around. Chippewa has a color or style for anyone, with the durability and comfort to match. Extra tall: The logger boots are built taller than most, stabilizing your feet through any work. Versatile: Chippewa designed the 9-inch boots to deliver regardless of climate or terrain. Expensive: They may break the bank, but don’t forget that you get what you pay for. 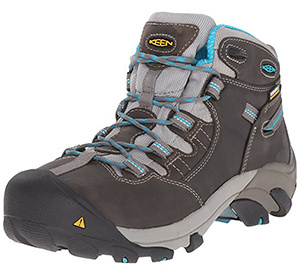 Women use KEEN’s boots for hiking, working, gardening, and adventuring. Not only are they easy on the wallet, but they’re definitely easy on your feet. KEEN has designed some of the best American made work boots for women and med alike, and customers simply cannot get enough. Width options: Customers enjoy the multiple width-options for an optimal fit. Value: A good pair of work boots will cost you but, compared to others on our list, KEEN’s boots are pretty affordable. Short: For some jobs, the short shaft may not be suitable. Finally, we’re back with another top-quality pair of Thorogood boots. While the first ones were more casual, the brand’s safety boots were designed to last through construction, logging, and more. No matter what terrain you’re preparing to face, Thorogood’s safety boots will support you to get the job done. Value: Though there may be a few cheaper options, Thorogood’s safety boots are a great bang-for-your-buck. Width options: Thorogood wants their customers to have the ideal fit, so there are various width options. Not for cold/ wet environments: They are not insulated or waterproof, so you shouldn’t use them in extreme cold and snow. To conclude, whether comfort, stability, or style is most important in your American made work boots, there’s an option on our list for you. With high-quality materials, top-notch features, and dedication, the American made boots you’ve seen here are sure to please for years to come. What work boots are your favorite?